I already created a page showing all the souvenir sheets from this series that have been forged. 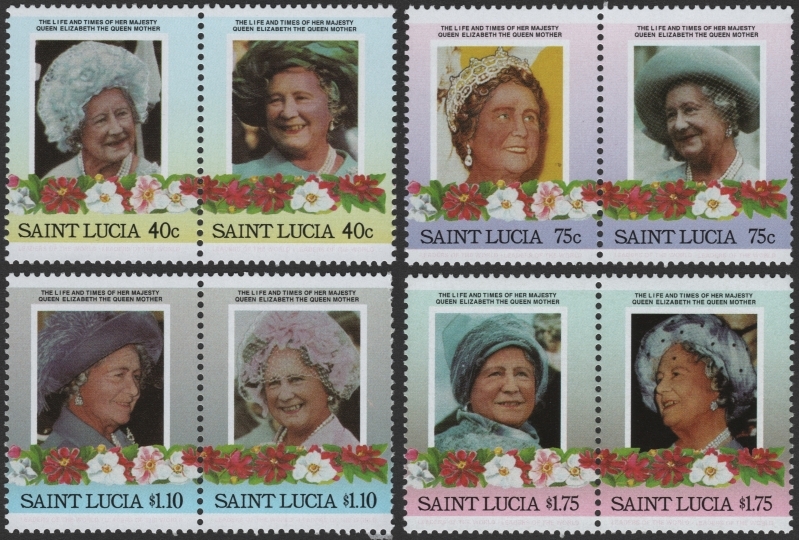 During that time I did not find forgeries of the single stamp issues for St. Lucia. I have now. I have recently discovered that modern fake stamps of this issue are being flooded onto the market. I can tell you that real dangerous	fakes or some call forgeries are being flooded on the market as I write this page in August of 2017. My research into the printer has enabled me to discover modern fake stamps have been created in 2014!! They are being spread across the world through online auction sites like ebay and Delcampe. Everything about them is fake except for one dangerous fact, they have the correct perf size. The gum type is different in it being white in color and very shiny. This gum type was not used until much later years, long after Format went bankrupt thus proving they were not produced by the Format International Security Printers. Obvious differences will be shown below. 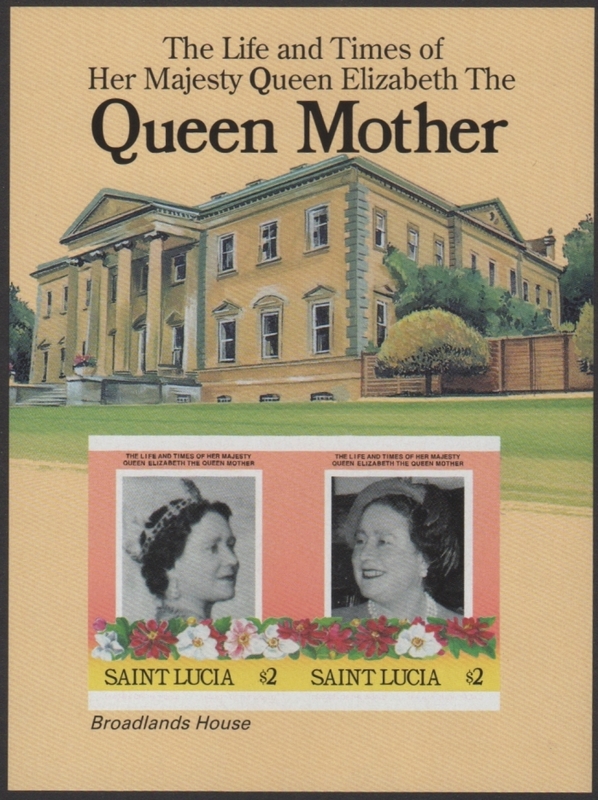 So far I have discovered complete sets of forgeries of the Saint Lucia Queen Elizabeth Leaders of the World 1985 85th Birthday issues. All are/have been offered online right now as I write this on August 25, 2017. I purchased the above imaged set of forged stamp pairs from a dealer in Canada who did not even realize that they were forgeries. I purchased them recently along with many other sets which have all proven to be the same type of forgeries I have documented over the passed two years. The souvenir sheet forgery I received in a bulk lot of 5 from Latvia based sellers on eBay in January 2016. I will use the 40c values for comparisons using an original from a set of panes I purchased many years ago before any of this happened. They are specimen overprinted which is proof of the original printing. You can see that the fonts on the genuine stamp are much bolder. 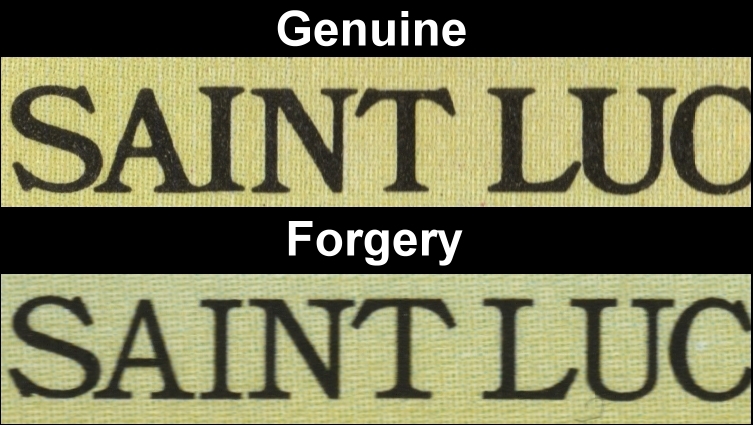 On all the genuine stamps the "A" in "SAINT" connects with the "I". It does not on any of the forgeries. Upper background is shades of light blue on the forgery. Upper background is shades of light green on genuine stamps. 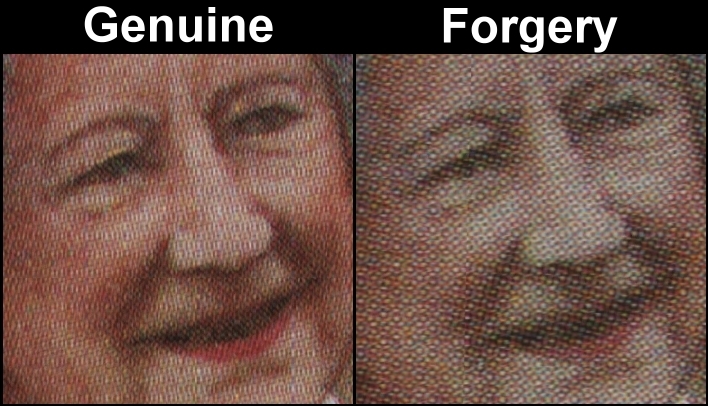 The queen's face is much more toned on genuine stamps having a reddish shading like a sun tan. On the forgeries her skin tone is pale with no toning. The flowers are bright red on genuine stamps. They are dull brick red on the forgeries. Upper background is shades of light lavender on the forgery. Upper background is shades of light pink on genuine stamps. The country name background is almost gray on genuine stamps. It is deep lavender on the forgeries. The queens hair is red-brown on the genuine left stamp versus brown on the forgeries left stamp. The queen's hat on the right stamp is shades of light blue on genuine stamps. It is shades of pale and light green on the forgeries. Upper background is shades of dark gray on the forgery. Upper background is shades of light gray on genuine stamps. The country name background is pale light green on genuine stamps. It is light blue on the forgeries. The queens hat is dark purple on the genuine left stamp versus dull mauve on the forgeries left stamp. The queen's hat on the right stamp has heavy shades of pink on genuine stamps. It has light shades of pink and looks much more white on the forgeries. Upper background is shades of light green to dark gray on the forgery. Upper background is shades of light green to light gray on genuine stamps. The country name background is pale salmon pink on genuine stamps. It is dull pink on the forgeries. 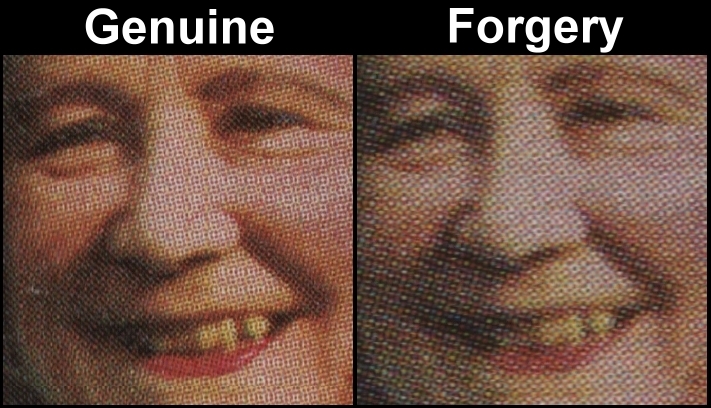 On the $1.75 pair the queen's face is much more toned on the forgery stamps having a golden shading like a sun tan. On the genuine stamps her skin tone is pale with very little toning. 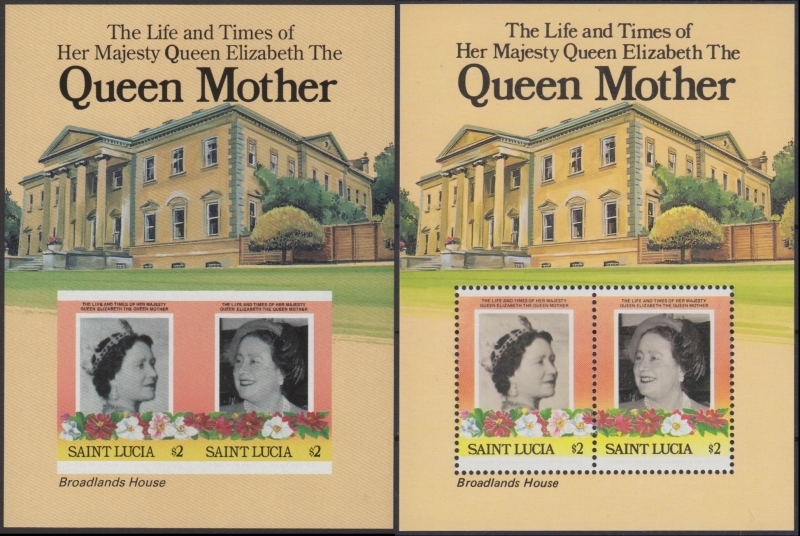 You can now define the fake Saint Lucia 1985 Queen Elizabeth 85th Birthday stamps and souvenir sheet easily and can now possibly avoid being ripped off! Sorry to say this, a lot of you already have been fooled and more of you will be until the right people get serious about it!